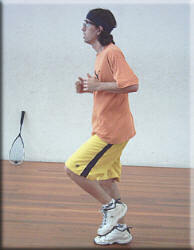 Just about any activity can be used for warming up for Squash. This section deals with individual activities. Find group activities here. Start off these warm ups at low to medium intensity. Use warming up time to prepare mentally if playing a competition game. Attain about 60 - 70% MHR before stretching. Let us know if you have any interesting warm ups that you use. Solo Drills can also be used as a warm up activity. Play “Simon says",eg Run and sit on the “tin”. Stand in the “service box” Jump touch the “outline”. Jump touch the “cutline”. Stand on the “short line”. Ghosting movements and racket swinging is an excellent way to warm up. Not only does it warm you up but gets you into the "groove". 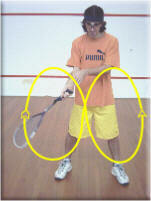 In order to develop smooth racket swinging and fluent footwork mark on court, using a ball, the following combination of strokes and travelling from, eg Nos. 1, 3 and 4 swinging your racket, a cross court toss, followed by a volley, followed by a boast, etc. and then practice continuous movement. By having a rest in between say 10 secs sets your heart would be working close to that of a game of squash, the rest in between sets would be approximately 6/7 seconds. Vary the length of the sets and keep the rest about 6/7 seconds. Place four balls in various positions around the court, commencing at the T, and have a rally knowing the position of the strokes to be retrieved are in the pre-determined places on the court. This video shows a players moving to various parts of the court to retrieve the ball, playing various shots, and moving back to the T - ghosting is just this, except the balls are placed on the floor, and with the racket in hand, the player pretends to have this rally. This gives the opportunity to look at the racket preparation, movement, and approach to the ball, as well as the recovery to the centre court.